6 days fermentation time is WAY too short. 14 days minimum from pitching to bottling. Yep. One of us read somewhere that as soon as the air lock stops bubbling we’re good to bottle. Realized the error after tasting it. You’ll probably be ok, assuming it’s a medium/low gravity ale and you pitched a healthy dose of yeast. 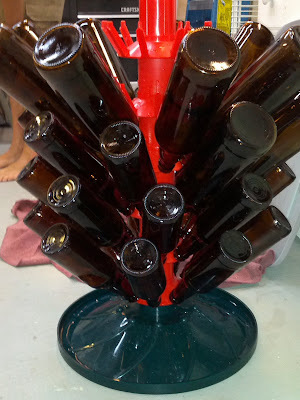 If your beer was not done fermenting, you may end up with bottle bombs, so place them in the frig as soon as they are carbed. I learned the hard way once and had to clean beer off the ceilings and walls of my basement. The only way to be sure fermentation is finished is to compare your original gravity to your final gravity. 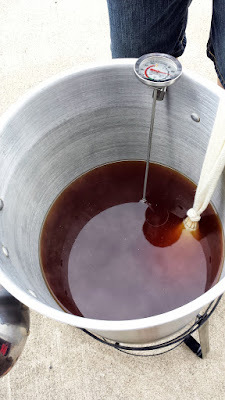 You’ll need to have a rough goal (based on your recipe) to hit for the wort (probably around ~1.050) and then a goal to hit for fermentation (probably around ~1.015). When you’ve hit the FG you’re expecting, it’s ready to keg/bottle. The airlock test is good for knowing when to take gravity readings, but can’t always be trusted. I had a stout that barely bubbled at all! You should definitely get a hydrometer so you know when the yeast is done. I typically leave my lower gravity beers for three weeks so I’m certain it’s done, plus it allows the beer to clear and form a solid, packed yeast cake. The hyrdometer was only 5 off so we thought we were in range… of course it was 5 off of the FG for a brown ale, it was later we realized we’d used a pale ale kit. How you really know fermentation is done when you get the same gravity reading 2-3 times over a few days. With that said, for my first 10-15 batches I never tested the gravity and I never had any bottle bombs. I usually waited 3-4 weeks and made sure the krausen dropped though. Now I use a refractometer to make sure batches are done. Anyway, cheers and congrats on your first and second home brew. I started almost 2 years ago and I’m hooked. I definitely feel I’ve taken it to the next level from only doing extract with dry yeast to all grain (using brew in a bag) and harvesting and storing yeast and yeast starters. Also even though kits are made for 5 gallons, nothing says you can’t do smaller batches. I’m brewing a 3 gallon batch tomorrow because I love the process of brewing, but like you, I like variety and even with my good beer loving gf, can’t drink 2 cases of beer if I’m brewing every few weeks in addition to the commercial beer we still buy. So my plan is to brew smaller batches more often. Try Gallon Batches of beer. So much easier and you only end up with 10-12 bottles. I don’t do that every time, but it’s a nice change up in between bigger 5G batches.